As we say in Irish, ‘Céad Míle Fáilte Romhat’ – a hundred thousand welcomes from Mike Ryan and his team at Executive Tours Ireland. We invite you to browse through our 2019 Tours section, we’re also taking bookings for 2020! As expert Irish Tour Operators, we can personalize any tour itinerary for anywhere in Ireland including your preferred airports. You can contact Mike personally from USA and Canada on this toll free number 1 888 793 0416 , globally on +353 877930447 or email chauffeurs@executivehire.ie to find out anything you need to know to start preparing for your dream vacation. All of our private drivers have been with us from the start, and we pride ourselves on offering the most personalized service you will find. We specialize in small escorted group tours and family tours in Ireland, using over a decade of experience, we will take you on a magical trip of a lifetime, where you will discover all of the renowned and hidden gems of Ireland. We are an Irish tour operator with a difference, we are a family run business and we always go the extra mile with our personal service to make your escorted tour of Ireland, a once in a lifetime experience. As your team on the ground, we will show you the real Ireland in a very special way that you will savor forever. 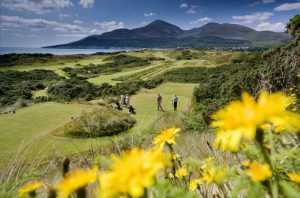 If it’s golf and/or sightseeing, we’ll make it a Luxury Tours Ireland vacation experience to remember. Our aim is to ensure that you experience the ultimate in luxury, style and comfort whilst our highly experienced and friendly chauffeur private driver guides inform, engage and entertain you. We can customize your itinerary to suit your preferences for any family or small group tour, golf vacation or sightseeing tour of Ireland. We know that your family and/or friends will be very grateful to you for booking your Ireland Tour with Mike Ryan at Executive Tours Ireland. We are a full member of the Ireland Golf Tour Operator Association (IGTOA) which means you have piece of mind knowing that by dealing with us you are working with a standard bearer for Irish golf tour vacations. Nobody says it quite like our clients. Throughout the years, our new and returning clients continue to use us because of the lengths we go to ensure their every need is not only met but exceeded; redefining standards for customized tours Ireland vacation packages. Whether that means organizing different activities for people within your family or small group tour, or helping you find your family roots, for the team at Executive Tours Ireland, its all in a days work. We are as flexible as you need us to be. We invite you to read what our clients think about us on our Testimonials Page, and also at our Trip Advisor page. We are further expanding our luxury Mercedes fleet and have recently taken delivery of new Mercedes vehicles to add to our stable. We have just commissioned another S-Class sedan vehicle as well as another luxuriously customized Mercedes Sprinter minibus and yet another Mercedes Viano. Each vehicle is prepared to Mike Ryan’s own specification with the discerning golfer and sightseeing guest in mind. Travel in comfort and luxury with self facing leather seating,Wi-Fi, DVD and monitors, refrigerated minerals and tall windows for best views, you’ll be well pampered whether you’re soaking up the views or enjoying being chauffeured to your next golf experience. There is still great value in coming to Ireland and we’re ready to help you book your chauffeur tours Ireland booking now toll free at 1 888 793 0416 and place a deposit! 1.Your very own private driver guide / personal chauffeur for the entire trip. 2. A top of the range Mercedes vehicle of your choice, with Air Con and Wi-Fi. 3. Best rates on all luxury hotels in Ireland and golf clubs in Ireland. 4. A personal and customized itinerary of your luxury and private tour of Ireland. Please to click here to email us anytime for a prompt response or call us now (numbers below) to chat with Mike and see how you can create your very own luxury and private tour Ireland experience. Thank you for visiting our site, please browse through our pages which we hope you find as informative and well presented as our chauffeur private drivers!